Habits tend to fall into 3 categories. 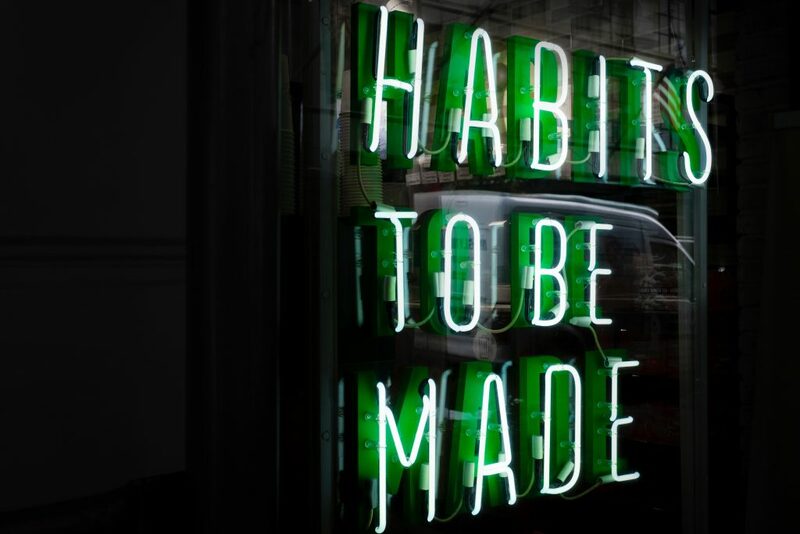 Habits that you want to create. Habits that you want to exchange for different ones. Each can feel challenging to achieve and even harder to sustain. Our emotions, past experiences and lifestyle all play a role in whether or not you will be able to do anything about the habit. You really want to stop eating that random bowl of cereal each night. You’re not hungry, it doesn’t make you feel better and actually weighs you down so that you feel uncomfortable and bloated before going to sleep. You know the habit doesn’t serve you, but yet day after day, you find yourself pouring the cheerios into a bowl and following what I call your “food script.” So, you wake up each day declaring this is the day you’re going to quit eating the cereal at night. Yet, dusk comes, you are feeling boredom, stress or exhaustion and start to think about eating that cereal “just one more time.” Then, the inner-dialoguing happens, you start to rationalize your decision for continuing the habit you just proclaimed you’d stop. And the vicious cycle continues, yet now you feel more crestfallen and unsure of your ability to ever make a meaningful change. A “habit exchange” challenge, on the other hand, simply replaces one habit that no longer serves you with a similar but separate one that is more in line with your long term goals. For instance. I had a client once who wanted to swap out his breakfast burritos for a green smoothie in the morning but was having a hard time making the switch. It had to take creating behavioral “chains” that egged on the newer, more fragile behavior. He had to recognize what the actual cue was for his desire to grab the burrito instead. He realized that it was his routine to make coffee, take a long walk and grab the burrito on his way home, often eating it standing up. In order to make this swap, he started to understand that his trigger and anchor, so to speak, was the coffee he made every morning. Using the already ingrained and practiced habit of preparing his coffee each morning, he was able to use this as the cue to also make his smoothie at the same time. This way, he simply dragged the less practiced behavior along with the stronger one hence accomplishing both tasks at the same time. He continued to take his walk but now did it after drinking his coffee and smoothie. This gave him the confidence and actual skills to learn how to replace one habit for another seamlessly. It feels comfortable and safe to do it. Human beings by design seek pleasure and avoid pain. So It makes sense and safe to do this same habit over and over again even if it has untoward consequences. You continue to do it for the relief and familiarity you experience. 2. You haven’t found other self-soothing techniques – yes, a lot of our habit formations arise because we need some sort of comfort or soothing. If you were never taught alternative ways to deal with discomfort, strong emotions, stress and exhaustion, you will continue to use whatever means necessary to find that comfort, even if it means doing the same habit over and over again. 3. “Neurons that fire together, wire together” This is an old adage meaning that if the neurons that fire in response to sounds, sights or other cues fires at the same time as the neurons that cause behaviors to form, the connections between those neural patterns will be even stronger, leaving you more challenged to change or extinguish that behavior. 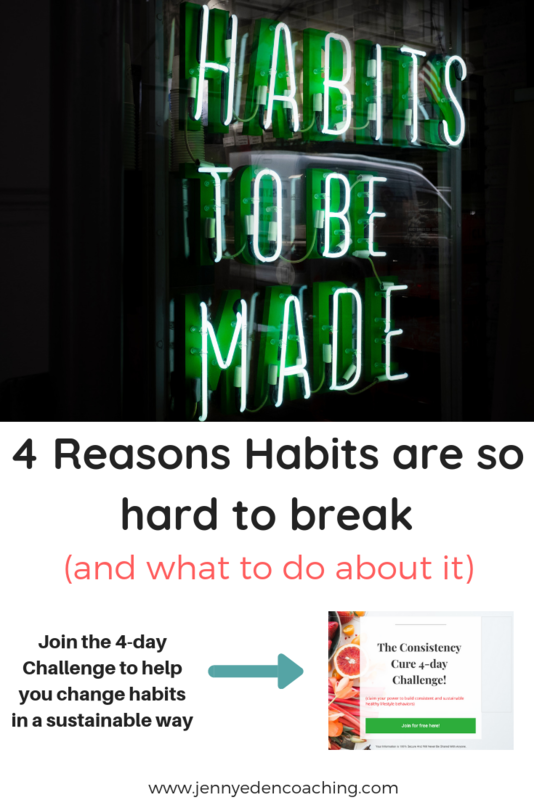 If you are finding yourself struggling with any of the create, extinguish or exchange habit challenges, then I invite you to join the most epic challenge of all: The Consistency cure Challenge! It all goes down Monday, January 28th. And the best part is that it’s FREE. Let me ask you: Does this sound like you after making lofty goal to change your behaviors at the start of each year? You’re on track for 3 weeks and then quickly slip into what you’ve always done. You’re motivated for a while but have no specific strategies to sustain it. You want to understand the brain chemistry behind behavioral change and why its so hard. If you said yes to one or more of these, you are in need of The Consistency Cure Challenge.